"The Manson Family" redirects here. For the film, see The Manson Family (film). The Manson Family was a desert commune and cult formed in California in the late 1960s. Led by Charles Manson, the group consisted of approximately 100 of his followers who lived an unconventional lifestyle with habitual use of hallucinogenic drugs. Most of the group members were young women from middle-class backgrounds, many of whom were radicalized by Manson's teachings and drawn by hippie culture and communal living. Charles Manson mugshot (1968). Manson was the founder and leader of the Manson Family. After Manson was released from prison for petty crimes in 1967, the Manson Family moved to San Francisco and later to a deserted ranch in the San Fernando Valley. Manson’s followers also included a small, devoted unit of mostly impressionable young women and girls. According to Susan Atkins, whose initial statements in late 1969 cast the die for the template henceforth applied to the telling of the story in popular media, the Manson family began to believe, without question, Manson's claims that he was a manifestation of Jesus and his prophecies of a race war. They gained national and international notoriety after the murder of actress Sharon Tate and four others on August 9, 1969 by Tex Watson and three other members of the Family, acting under the instructions of Charles Manson. Group members were also responsible for a number of other murders, assaults, petty crimes and thefts. It has been suggested that this section be merged into Charles Manson. (Discuss) Proposed since January 2019. In 1967 Brunner had become pregnant by Manson and, on April 15, 1968, gave birth to a son she named Valentine Michael (nicknamed "Pooh Bear") in a condemned house in Topanga Canyon, assisted during the birth by several of the young women from the Family. Brunner (like most members of the group) acquired a number of aliases and nicknames, including: "Marioche", "Och", "Mother Mary", "Mary Manson", "Linda Dee Manson" and "Christine Marie Euchts". Actor Al Lewis, who had Manson babysit his children on a couple of occasions, described him as "a nice guy when I knew him". Through Phil Kaufman, Manson got an introduction to young Universal Studios producer Gary Stromberg, then working on a film adaptation of the life of Jesus set in modern America with a black Jesus and southern redneck "Romans". Stromberg thought Manson made interesting suggestions about what Jesus might do in a situation, seeming strangely attuned to the role; to illustrate the place of women he had one of his women kiss his feet, but then kissed hers in return. At the beach one day, Stromberg watched while Manson preached against a materialistic outlook only to be questioned about his well-furnished bus. Nonchalant, he tossed the bus keys to the doubter who promptly drove it away while Manson watched apparently unconcerned. According to Stromberg, Manson had a dynamic personality with an ability to read a person's weaknesses and "play" them. Trying to co-opt an influential individual from a motorcycle gang by granting him access to "Family" women, Manson claimed to be sexually pathetic and convinced the biker that his outsized endowment was all that kept the "Family" females at Spahn ranch. On one occasion, the enraged father of a runaway girl who had joined the "Family" pointed a shotgun at Manson and told him he was about to die. Manson quietly invited him in. The account given in Manson in His Own Words is that Manson first met Wilson at a friend's San Francisco house where Manson had gone to obtain cannabis. The drummer supposedly gave Manson his Sunset Boulevard address and invited him to stop by when he came to Los Angeles. Wilson himself said, in a 1968 Record Mirror article, that after mentioning the Beach Boys' involvement with Maharishi Mahesh Yogi to a group of strange women, "they told me they too had a guru, a guy named Charlie." Manson established a base for the group at Spahn's Movie Ranch, not far from Topanga Canyon Boulevard, in August 1968, after Wilson's manager evicted the Family. The entire Family then relocated to the ranch. :250–253 The ranch had been a television and movie set for Western productions. However, by the late 1960s, the buildings had deteriorated and the ranch was earning money primarily by selling horseback rides. Charles Watson soon joined the group at Spahn's ranch. 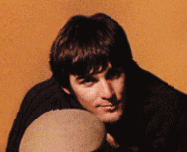 Watson, a small-town Texan who had quit college and moved to California, met Manson at Dennis Wilson's house. Watson gave Wilson a ride while Wilson was hitchhiking after his car was wrecked. In first days of November 1968, Manson established the Family at alternative headquarters in Death Valley's environs, where they occupied two unused or little-used ranches, Myers and Barker. The former, to which the group had initially headed, was owned by the grandmother of a new woman (Catherine Gillies) in the Family. The latter was owned by an elderly local woman (Arlene Barker) to whom Manson presented himself and a male Family member as musicians in need of a place congenial to their work. When the woman agreed to let them stay if they'd fix things up, Manson honored her with one of the Beach Boys' gold records, several of which he had been given by Wilson. While back at Spahn Ranch, no later than December, Manson and Watson visited a Topanga Canyon acquaintance who played them the Beatles' recently released double album, The Beatles (also known as the "White Album"). Manson became obsessed with the group. At McNeil Island prison, he had told fellow inmates, including Alvin Karpis, that he could surpass the group in fame;:200–202, 265 to the Family, he spoke of the group as "the soul" and "part of the hole in the infinite". For some time, Manson had been saying that racial tension between blacks and whites was growing and that blacks would soon rise up in rebellion in America's cities. He had emphasized Martin Luther King Jr.'s assassination, which had taken place on April 4, 1968. On a bitterly cold New Year's Eve at Myers Ranch, the Family members gathered outside around a large fire, listening as Manson explained that the social turmoil he had been predicting had also been predicted by the Beatles. The White Album songs, he declared, told it all, although in code. In fact, he maintained (or would soon maintain), the album was directed at the Family, an elect group that was being instructed to preserve the worthy from the impending disaster. In early January 1969, the Family escaped the desert's cold and positioned itself to monitor L.A.'s supposed tensions by moving to a canary-yellow home in Canoga Park, not far from the Spahn Ranch. :244–247 Because this locale would allow the group to remain "submerged beneath the awareness of the outside world",:244–247 Manson called it the Yellow Submarine, another Beatles reference. There, Family members prepared for the impending apocalypse, which around the campfire Manson had termed "Helter Skelter", after the song of that name. By February, Manson's vision was complete. The Family would create an album whose songs, as subtle as those of the Beatles, would trigger the predicted chaos. Ghastly murders of whites by blacks would be met with retaliation, and a split between racist and non-racist whites would yield whites' self-annihilation. Blacks' triumph, as it were, would merely precede their being ruled by the Family, which would ride out the conflict in "the bottomless pit", a secret city beneath Death Valley. At the Canoga Park house, while Family members worked on vehicles and pored over maps to prepare for their desert escape, they also worked on songs for their world-changing album. When they were told Terry Melcher was to come to the house to hear the material, the women prepared a meal and cleaned the place, but Melcher never arrived. There are alternative theories to the Helter Skelter scenario and whether or not it was the actual motive behind the murders. According to Manson Family associate Bobby Beausoleil, it was actually Beausoleil's arrest for the torture and murder of Gary Hinman that instigated the Manson Family's ensuing murder spree—enacted to convince police that the killer(s) of Gary Hinman were in fact still at large. This has been substantiated by interviews of Beausoleil by Truman Capote, and by Ann Louise Bardach in 1981. On March 23, 1969,:228–233 Manson, uninvited, entered 10050 Cielo Drive, which he had known as Melcher's residence. :155–161 This was Rudi Altobelli's property; Melcher was only a previous tenant. As of February 1969,:28–38 the tenants were Sharon Tate and Roman Polanski. It has been suggested that Tate murders be merged into this section. (Discuss) Proposed since January 2019. Manson's belief that he had killed Crowe was seemingly confirmed by a news report of the discovery of the dumped body of a Black Panther in Los Angeles. Although Crowe was not a member of the Black Panthers, Manson concluded he had been and expected retaliation from the Panthers. He turned Spahn Ranch into a defensive camp, with night patrols of armed guards. "If we'd needed any more proof that Helter Skelter was coming down very soon, this was it," Tex Watson would later write. "Blackie was trying to get at the chosen ones." Gary Allen Hinman was a music teacher and PhD student at UCLA. He had been described as a "kind, gentle soul" who would often open his house up to those needing a place to stay. At some point in the late 1960s, he befriended members of the Manson Family, with some staying at his home on occasion. On the night of August 8, 1969, Manson directed Watson to take Susan Atkins, Linda Kasabian, and Patricia Krenwinkel to Melcher's former home at 10050 Cielo Drive in Los Angeles and kill everyone there. The home had only recently been rented to celebrity couple Sharon Tate and director Roman Polanski (Polanski was away in Europe working on A Day at the Beach, which he would later end up only producing). Manson told the three women to do as Watson told them. The Family members proceeded to kill the five people they found: actress Sharon Tate (who was eight months pregnant; her unborn child was also killed), who was living there at the time; Jay Sebring, Abigail Folger, and Wojciech Frykowski, who were visiting her; and Steven Parent, who had been visiting the caretaker of the home. Atkins wrote "pig" in blood on the front door as they left. The murders created a nationwide sensation. Before leaving Spahn Ranch, Watson had complained to Manson of the inadequacy of the previous night's weapons. :258–269 Now, sending the women from the kitchen to the bedroom to which Rosemary LaBianca had been returned, he went to the living room and began stabbing Leno LaBianca with a chrome-plated bayonet. The first thrust went into the man's throat. The Tate murders became national news on August 9, 1969. The Polanskis' housekeeper, Winifred Chapman, had arrived for work that morning and discovered the murder scene. :5–6, 11–15 On August 10, detectives of the Los Angeles County Sheriff's Department, which had jurisdiction in the Hinman case, informed Los Angeles Police Department (LAPD) detectives assigned to the Tate case of the bloody writing at the Hinman house. Thinking the Tate murders were a consequence of a drug transaction, the Tate team ignored this and the crimes' other similarities. :28–38 The Tate autopsies were under way and the LaBianca bodies were yet to be discovered. Held briefly as a Tate suspect, Garretson told police he had neither seen nor heard anything on the murder night. He was released on August 11, 1969, after undergoing a polygraph examination that indicated he had not been involved in the crimes. :28–38, 42–48 Interviewed decades later, he stated he had, in fact, witnessed a portion of the murders, as the examination suggested. Garretson died in August 2016. County Sheriff mugshot of Manson August 16, 1969. He was arrested on suspicion of car theft. Those charges were later dropped on account of a misdated warrant. The People v. Charles Manson et al. The trial began June 15, 1970.:297–300 The prosecution's main witness was Kasabian, who, along with Manson, Atkins, and Krenwinkel, had been charged with seven counts of murder and one of conspiracy. :185–188 Since Kasabian, by all accounts, had not participated in the killings, she was granted immunity in exchange for testimony that detailed the nights of the crimes. :214–219, 250–253, 330–332 Originally, a deal had been made with Atkins in which the prosecution agreed not to seek the death penalty against her in exchange for her grand jury testimony on which the indictments were secured; once Atkins repudiated that testimony, the deal was withdrawn. :169, 173–184, 188, 292 Because Van Houten had participated only in the LaBianca killings, she was charged with two counts of murder and one of conspiracy. Testimony that Manson had said "now is the time for Helter Skelter" was supplemented with Kasabian's testimony that, on the night of the LaBianca murders, Manson considered discarding Rosemary LaBianca's wallet on the street of a black neighborhood. Having obtained the wallet in the LaBianca house, he "wanted a black person to pick it up and use the credit cards so that the people, The Establishment, would think it was some sort of an organized group that killed these people." On his direction, Kasabian had hidden it in the women's restroom of a service station near a black area. :176–184, 190–191, 258–269, 369–377 "I want to show blackie how to do it," Manson had said as the Family members drove away after leaving the LaBianca house. In chambers, the women's lawyers told the judge their clients wanted to testify that they had planned and committed the crimes and that Manson had not been involved. :382–388 By resting their case, the defense lawyers had tried to stop this; Van Houten's attorney, Ronald Hughes, vehemently stated that he would not "push a client out the window". In the prosecutor's view, it was Manson who was advising the women to testify in this way as a means of saving himself. :382–388 Speaking about the trial in a 1987 documentary, Krenwinkel said, "The entire proceedings were scripted—by Charlie." In February 1972, the death sentences of all five parties were automatically reduced to life in prison by People v. Anderson, 493 P.2d 880, 6 Cal. 3d 628 (Cal. 1972), in which the California Supreme Court abolished the death penalty in that state. :488–491 After his return to prison, Manson's rhetoric and hippie speeches held little sway. Though he found temporary acceptance from the Aryan Brotherhood, his role was submissive to a sexually aggressive member of the group at San Quentin. Before the conclusion of Manson's Tate–LaBianca trial, a reporter for the Los Angeles Times tracked down Manson's mother, remarried and living in the Pacific Northwest. The former Kathleen Maddox claimed that, in childhood, her son had suffered no neglect; he had even been "pampered by all the women who surrounded him." On November 8, 1972, the body of 26-year-old Vietnam Marine combat veteran James L.T. Willett was found by a hiker near Guerneville, California. Months earlier, he had been forced to dig his own grave, and then was shot and poorly buried; his body was found with one hand protruding from the grave and the head and other hand missing, most likely because of scavenging animals. His station wagon was found outside a house in Stockton where several Manson followers were living, including Priscilla Cooper, Lynette "Squeaky" Fromme, and Nancy Pitman. Police forced their way into the house and arrested several of the people there, along with Fromme, who had called the house after they had arrived. The body of James Willett's 19-year-old wife Lauren "Reni" Chavelle Olmstead Willett was found buried in the basement. She had been killed very recently by a gunshot to the head, in what the Family members initially claimed was an accident. It was later suggested that she was killed out of fear that she would reveal who killed her husband, as the discovery of his body had become prominent news. The Willetts' infant daughter was found alive in the house. Michael Monfort[who?] pleaded guilty to murdering Reni Willett, and Priscilla Cooper, James Craig, and Nancy Pitman pleaded guilty as accessories after the fact. Monfort and William Goucher[who?] later pleaded guilty to the murder of James Willett, and James Craig pleaded guilty as an accessory after the fact. The group had been living in the house with the Willetts while committing various robberies. Shortly after killing Willett, Monfort had used Willett's identification papers to pose as Willett after being arrested for an armed robbery of a liquor store. News reports suggested that James Willett was not involved in the robberies and wanted to move away, but was killed out of fear that he would talk to police. After leaving the Marines following two tours in Vietnam, Willett had been an ESL teacher for immigrant children. On September 5, 1975, the Family rocketed back to national attention when Squeaky Fromme attempted to assassinate U.S. President Gerald Ford. :502–511 The attempt took place in Sacramento, to which she and Manson follower Sandra Good had moved to be near Manson while he was incarcerated at Folsom State Prison. A subsequent search of the apartment shared by Fromme, Good, and a Family recruit turned up evidence that, coupled with later actions on the part of Good, resulted in Good's conviction for conspiring to send threatening communications through the United States mail and transmitting death threats by way of interstate commerce. The threats involved corporate executives and U.S. government officials vis-à-vis supposed environmental dereliction on their part. :502–511 Fromme was sentenced to 15 years to life, becoming the first person sentenced under United States Code Title 18, chapter 84 (1965), which made it a Federal crime to attempt to assassinate the President of the United States. In December 1987, Fromme, serving a life sentence for the assassination attempt, escaped briefly from Federal Prison Camp, Alderson, in West Virginia. She was trying to reach Manson, who she had heard had testicular cancer; she was apprehended within days. :502–511 She was released on parole from Federal Medical Center, Carswell on August 14, 2009. In a 1998–1999 interview in Seconds magazine, Bobby Beausoleil rejected the view that Manson ordered him to kill Gary Hinman. He stated that Manson did come to Hinman's house and slash Hinman with a sword, which he had previously denied in a 1981 interview with Oui magazine. Beausoleil stated that when he read about the Tate murders in the newspaper, "I wasn't even sure at that point—really, I had no idea who had done it until Manson's group were actually arrested for it. It had only crossed my mind and I had a premonition, perhaps. There was some little tickle in my mind that the killings might be connected with them ..." In the Oui magazine interview, he had stated, "When the Tate-LaBianca murders happened, I knew who had done it. I was fairly certain." William Garretson, once the young caretaker at 10050 Cielo Drive, indicated in a program (The Last Days of Sharon Tate) broadcast on July 25, 1999 on E!, that he had, in fact, seen and heard a portion of the Tate murders from his location in the property's guest house. This corroborated the unofficial results of the polygraph examination that had been given to Garretson on August 10, 1969, and that had effectively eliminated him as a suspect. The LAPD officer who conducted the examination had concluded Garretson was "clean" on participation in the crimes but "muddy" as to his having heard anything. :28–38 Garretson did not explain why he had withheld his knowledge of the events. On March 15, 2008, the Associated Press reported that forensic investigators had conducted a search for human remains at Barker Ranch the previous month. Following up on longstanding rumors that the Family had killed hitchhikers and runaways who had come into its orbit during its time at Barker, the investigators identified "two likely clandestine grave sites ... and one additional site that merits further investigation." Though they recommended digging, CNN reported on March 28 that the Inyo County sheriff, who questioned the methods they employed with search dogs, had ordered additional tests before any excavation. On 9 May, after a delay caused by damage to test equipment, the sheriff announced that test results had been inconclusive and that "exploratory excavation" would begin on 20 May. In the meantime, Charles "Tex" Watson had commented publicly that "no one was killed" at the desert camp during the month-and-a-half he was there, after the Tate–LaBianca murders. On 21 May, after two days of work, the sheriff brought the search to an end; four potential gravesites had been dug up and had been found to hold no human remains. As the 40th anniversary of the Tate–LaBianca murders approached, in July 2009, Los Angeles magazine published an "oral history" in which former Family members, law enforcement officers, and others involved with Manson, the arrests, and the trials offered their recollections of — and observations on — the events that made Manson notorious. In the article, Juan Flynn, a Spahn Ranch worker who had become associated with Manson and the Family, said, "Charles Manson got away with everything. People will say, 'He's in jail.' But Charlie is exactly where he wants to be." Charles Manson died of a heart attack and complications from colon cancer on November 19, 2017. He was 83 years old. ^ "What ever happened to the other Manson family cult members?". ^ "The Infamous Manson Family". Biography. ^ "Where are the Manson Family members now?". Bbc.co.uk. November 20, 2017. ^ "Susan Atkins 12/1/69 Caruso/Caballero Interview - Charles Manson Family and Sharon Tate-Labianca Murders Updates & News". Cielodrive.com. Retrieved December 22, 2018. ^ "Grand Jury Testimony: Susan Atkins". Cielodrive.com. Retrieved December 22, 2018. ^ a b c d e f g h i j k l m n o p q r s t u v w x y z aa ab ac ad ae af ag ah ai aj ak al am an ao ap aq ar as at au av aw ax ay az ba bb bc bd be bf bg bh bi bj bk bl bm bn bo bp bq br bs bt bu bv bw bx by bz ca cb cc cd ce cf cg ch ci cj ck cl cm cn co cp cq cr cs ct cu cv cw cx cy cz da db dc dd de df dg dh di dj dk dl dm dn do dp dq dr ds dt du dv dw dx Bugliosi, Vincent with Gentry, Curt. Helter Skelter — The True Story of the Manson Murders 25th Anniversary Edition, W.W. Norton & Company, 1994. ISBN 0-393-08700-X, OCLC 15164618. ^ Manson: The Life and Times of Charles Manson. By Jeff Guinn. p. 124. ^ Bugliosi, Vincent; Gentry, Curt (1974). Helter Skelter. Arrow Books Limited. p. 146. ISBN 0-09-997500-9. ^ a b c Watson, Charles as told to Ray Hoekstra. "Will You Die for Me?". aboundinglove.org. Archived from the original on April 5, 2007. Retrieved May 3, 2007. ^ The Story of the Abandoned Movie Ranch Where the Manson Family Launched Helter Skelter. Retrieved March 10, 2016. ^ "Watson, Ch. 4". Aboundinglove.org. Archived from the original on December 12, 2010. Retrieved November 28, 2010. ^ "1". Manson. aboundinglove.org. Manson's Right-Hand Man Speaks Out!. ISBN 0-9678519-1-2. Archived from the original on October 11, 2007. Retrieved November 21, 2007. ^ a b c "Watson, Ch. 11". Aboundinglove.org. Archived from the original on November 19, 2010. Retrieved November 28, 2010. ^ a b The Influence of the Beatles on Charles Manson Archived March 9, 2007, at the Wayback Machine. UMKC Law. Retrieved April 7, 2006. ^ a b Watson, Ch. 12 Archived August 18, 2013, at the Wayback Machine. ^ Testimony of Paul Watkins in the Charles Manson Trial Archived March 20, 2007, at the Wayback Machine UMKC Law. Retrieved April 7, 2007. ^ Jailhouse Interview: Bobby Beausoleil by Ann Louise Bardach Retrieved March 10, 2016. ^ "Hi-Standard Double Nine Longhorn "Buntline" Styled .22 Caliber Revolver - Charles Manson Family and Sharon Tate-Labianca Murders". Cielodrive.com. ^ "Manson Family Crime: The Shooting of Bernard Crowe". Findery.com. ^ a b c d "Watson, Ch. 13". Aboundinglove.org. August 8, 1969. Archived from the original on November 19, 2010. Retrieved November 28, 2010. ^ a b "Gary Hinman - Charles Manson Family and Sharon Tate-Labianca Murders". Cielodrive.com. ^ a b "Beausoleil Seconds interviews". beausoleil.net. Archived from the original on June 7, 2007. ^ "Sharon Tate murder 10 years ago". UPI. The Hour. August 9, 1979. Retrieved January 25, 2016. ^ a b c d e f g h "Watson, Ch. 15". Aboundinglove.org. Archived from the original on November 19, 2010. Retrieved November 28, 2010. ^ "Watson, Ch. 2". Aboundinglove.org. Archived from the original on November 11, 2010. Retrieved November 28, 2010. ^ a b "People v. Manson". Law.justia.com. 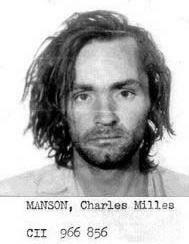 ^ "Charles Manson facts, information, pictures - Encyclopedia.com articles about Charles Manson". Encyclopedia.com. ^ Biography—"Charles Manson." A&E Network. ^ George, Edward; Dary Matera (1999). Taming the Beast: Charles Manson's Life Behind Bars. Macmillan. pp. 42–45. ISBN 978-0-312-20970-4. Retrieved November 18, 2015. ^ Smith, Dave. Mother Tells Life of Manson as Boy. 1971 article; retrieved June 5, 2007. 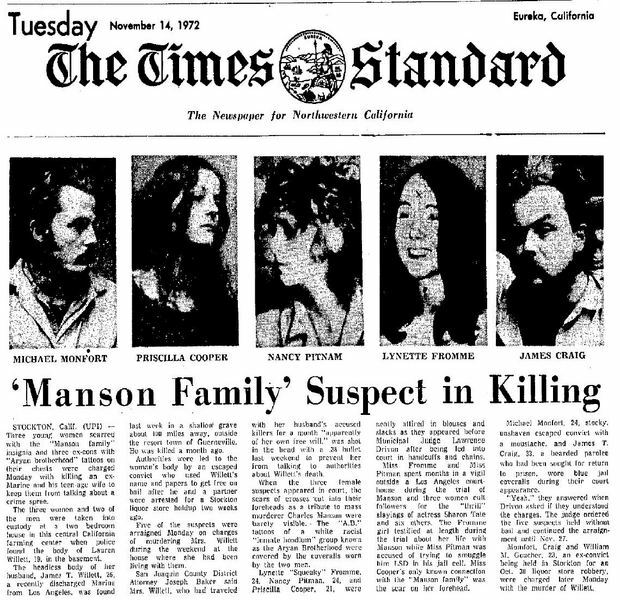 ^ a b Manson Family Suspect in Killing Archived June 18, 2012, at the Wayback Machine, The Times Standard, November 14, 1972. ^ "Two men and three women charged with murder of 19-year-old girl", Reuters News Service, 1972. 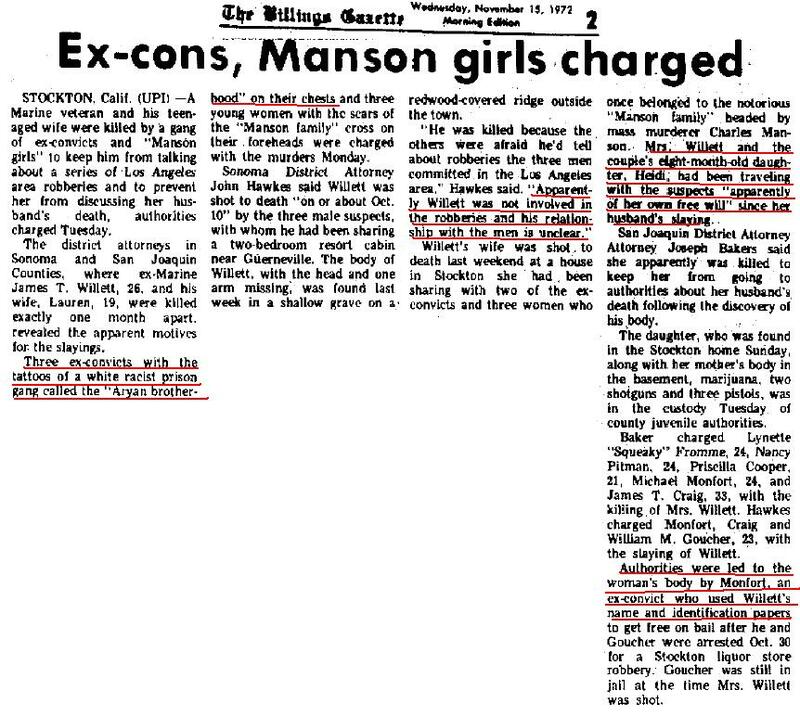 ^ "Ex-cons, Manson Girls Charged" Archived June 18, 2012, at the Wayback Machine, The Billings Gazette, November 15, 1972. ^ "18 U.S.C. § 1751". Law.cornell.edu. June 28, 2010. Retrieved November 28, 2010. ^ Press, Associated (September 25, 2009). "Manson follower Susan Atkins dies at 61". The Guardian. Retrieved September 25, 2009. ^ "Charles Manson Murders". Most Evil. Season 3. Episode 1. January 31, 2008. Discovery Channel. Archived from the original on February 22, 2008. ^ More tests at Manson ranch for buried bodies Archived March 29, 2008, at the Wayback Machine. CNN.com. Retrieved March 28, 2008. ^ Authorities to dig at old Manson family ranch Archived May 17, 2008, at the Wayback Machine cnn.com. Retrieved May 9, 2008. ^ Letter from Manson lieutenant. Archived May 10, 2008, at the Wayback Machine CNN. Retrieved May 9, 2008. ^ Monthly View – May 2008. Archived July 14, 2014, at the Wayback Machine Aboundinglove.org. Retrieved May 9, 2008. ^ Four holes dug, no bodies found ... Archived March 25, 2009, at the Wayback Machine iht.com. Retrieved May 26, 2008. ^ Dig turns up no bodies at Manson ranch site Archived May 22, 2011, at the Wayback Machine CNN.com, May 21, 2008. Retrieved May 26, 2008. ^ "Manson, About the Show". History Channel. Archived from the original on October 2, 2009. Retrieved October 27, 2009. ^ Steve Oney (July 1, 2009). "Manson Web Extra: LAST WORDS". Los Angeles magazine. Retrieved July 8, 2009.